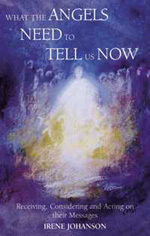 The first part of this unique book focuses on Irene Johanson's experiences of being attentive to angelic guidance during her many years' work as a priest. The second part consists of messages and information received through a friend, Agnes, who represents a new kind of clairvoyance. Agnes's ability to communicate spiritually with the angelic world has the character of clarity and wakefulness. Unlike many mediumistic or channelling methods, hers does not entail a dimming of consciousness. The messages Agnes receives contain important guidance from the angels to humanity, including advice on how to relate to angels and how to receive clear messages from them. The book also includes answers to esoteric questions asked by Irene Johanson about the Archangel Michael, the Apocalypse, Jesus Christ, the Mother of God, and much more. IRENE JOHANSON was born in 1928. She came into contact with Rudolf Steiner's philosophy after the War, and decided to train to become a teacher. Later, she studied at the Priest Seminary of the Christian Community in Stuttgart, and was ordained in 1956. She became the priest in charge of the Munich congregation - a position she has held ever since - while also lecturing widely, and visiting Russia regularly since 1979. Much of her work centres on children and youth, and she has founded two establishments dedicated to helping young people find their way in life. She is the author of several books.